Have decay or trauma compromised the health or strength of one of your teeth? 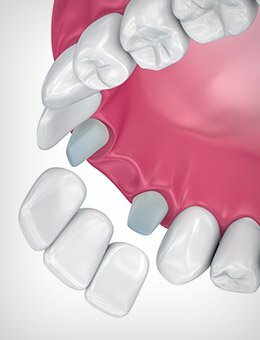 Do you have one or more gaps in your smile because of missing teeth? At Murphy Family Dentistry, we offer two effective solutions for helping patients reclaim their good health and wellbeing. Dental crowns can protect and restore struggling dental structure, while bridges recreate whole teeth sturdily and beautifully. Both styles of restorations will be painstakingly personalized by our team here in Murphy, TX. Is crown or a bridge right for you? Dr. Najari and Dr. Nguyen will help you answer that question during a free consultation. For patients who only need to strengthen an existing tooth, we may recommend treatment with a crown. If you're missing a tooth, we'll talk to you about the benefits of treatment with dental implants and bridges. You can learn more about both services below. Why Choose Murphy Family Dentistry for Dental Crowns & Bridges? A dental crown is a common restoration designed to help patients improve the strength and appearance of a tooth damaged by decay or injury. They can be made from a range of materials, including gold. The most natural-looking material for a crown is porcelain. When possible, we always try to provide our patients with a porcelain crown so that their smile’s natural appearance is preserved. Most crown procedures can be completed in as few as two visits to our Murphy office. Do you have a gap in your smile caused by a missing tooth? While dental implants are often the preferred method of treatment for this type of problem, another alternative option would be a fixed bridge. A bridge will help you replace the missing tooth, preserving your smile's alignment and improving its functionality and appearance. 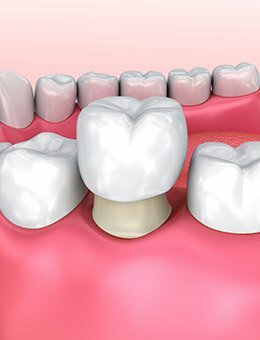 Traditionally, bridges are anchored in place with two dental crowns for stability, but this method does require healthy tooth structure to be minimized. Implant-retained bridges are a good alternative because of their improved health benefits and longer lifespan. To find out which solution is right for you, call Murphy Family Dentistry today to reserve your free consultation.